Georgia loves her vegetables...errr, should I say Veggies. She's been able to sing the VeggieTales theme song for quite some time now. "Wanna watch Bob," is her simple request. Although she knows Larry, Junior, and many of the other characters...Bob the tomato is the namesake for her of this creative computer-animated series fused with fun and a Biblical-lesson. 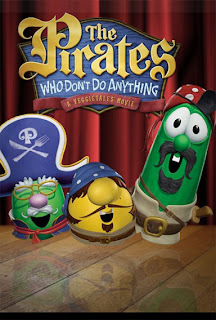 What once was a skit during a "Silly Songs With Larry" several episodes ago, "The Pirates Who Don't Do Anything" is now a movie. The family including Papa & Grammie went to see it Saturday morn. Often, there aren't many good movies available to actually take a kid to a theatre. This one is perfect, fun, teaches about how a kid can be a hero, and is about pirates - ye can't beat that, me hearties! Arrrrrggggghhhh!